I have always loved to make gingerbread houses at Christmas-time. Mainly because I love building and decorating the structures and partly because it is an exuse to buy piles of candy. When I was really little we always made them with graham crackers, but as I got older I would make them out of gingerbread. This was usually done over Christmas break, while I was at my parent's house, but over the last 10 years or so I haven't had the time to do one. This year I made it one of my goals to complete a gingerbread house. 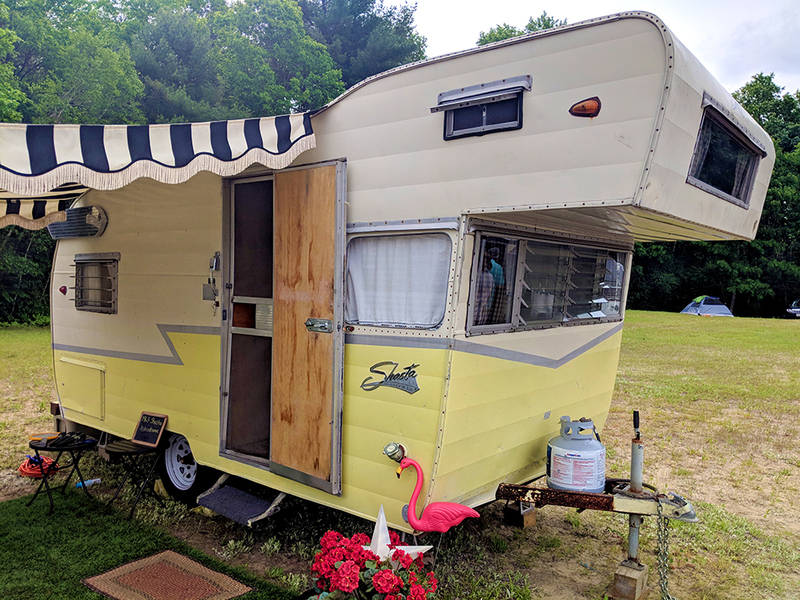 This past summer, we went to two outdoor vintage markets that also featured a vintage camper show. 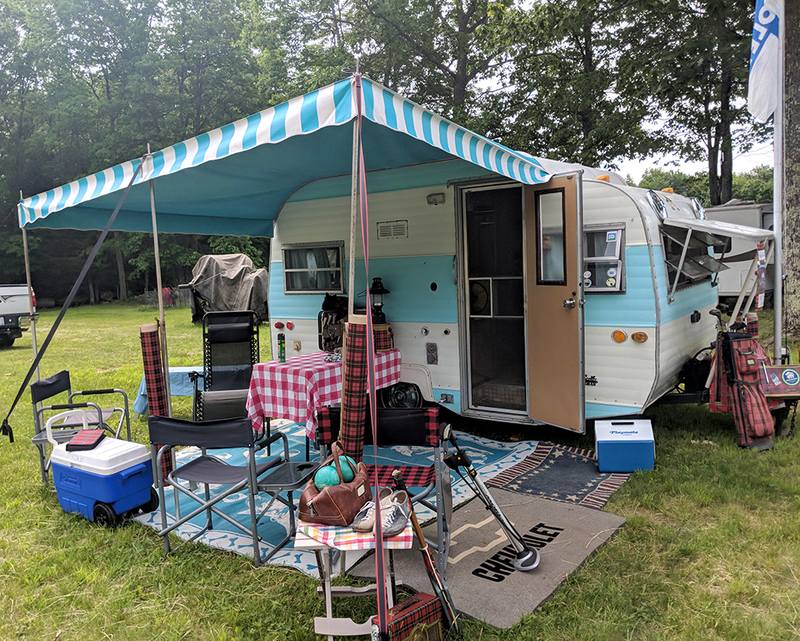 I’ve become obsessed with 1950s and 60s vintage campers and would love to have one to renovate myself sometime. In the meantime, I decided that a vintage camper would be the perfect thing to make out of gingerbread. 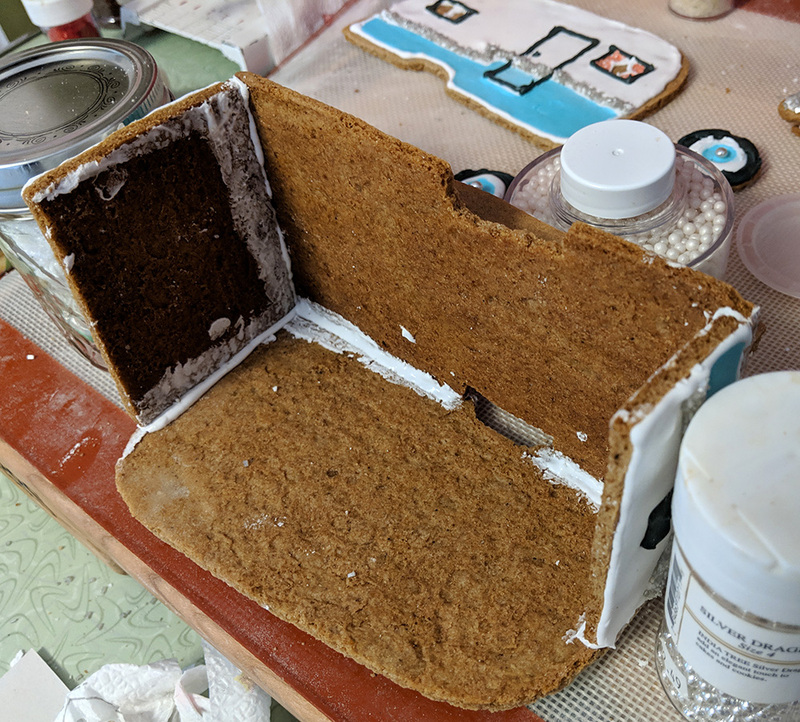 Since I haven’t made even a simple gingerbread house in over 10 years, a camper was perhaps a bit ambitious, but that hasn’t stopped me before. I knew the sides and bottom would be easy enough to do, so started with those. For the design I downloaded the plans for a 1961 Shasta Airflyte trailer Putz house from Retrorenovation.com I redrew the plans at a larger size and made templates to trace out the cookie pieces for the bottom, sides, back, front, wheels and decorative wings. I didn’t want all the weight of the trailer to rest on the two wheels of the trailer so I also cut out some long supports for the bottom. I decorated the sides, back and front with royal icing by first piping the design in white icing and then flooding the inside of the piping work with thinner, colored icing. For the Shasta trailer’s signature silver strip, I used silver sugar. Once the icing design had set I started to glue the bottom and sides together. Some of the decorated trailer pieces. The bottom of the camper with the long supports for the base. Some of the sides being glued to the bottom. My next challenge was to figure out the curved roof. My first plan was to make the roof out of three small sections; two curved sections and then the flat middle piece. I thought this might look clunky so decided that having the roof as one continuous piece would be better. For my first attempt I cut a rectangle from a piece of cookie dough and baked it flat. While it was still warm, I draped it over the curved sides to shape it. This worked for a few seconds, but the middle, unsupported parts of the roof started to collapse before it could cool. I then decided to bake the roof portion on a mold and then let it cool in place before removing it. I created a mold out of cardboard, which I then covered in aluminum foil. I placed the roof piece on the mold, baked it in the oven and removed it once it had cooled. The aluminum foil-covered frame with the roof piece. To ensure that the roof had enough support I added beams to my trailer using peppermint sticks. Then, after trimming the roof piece down a bit, I set it in place and glued it on with icing. 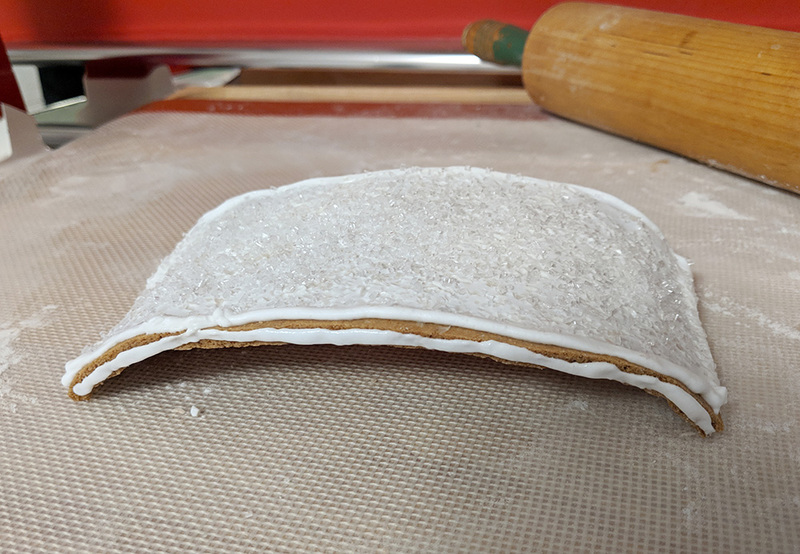 There were seams where the roof met the back and front pieces, but I covered it with a thick layer of icing and sparkling sugar to simulate snow. The peppermint stick roof supports. Finally came my favorite part of gingerbread house-making: decorating with candy. I cut down gumdrops into Christmas light shapes and rolled those in sugar to cover up the cut bits. I then piped a bit of royal icing, dyed black, for the cord and the base of the bulbs. 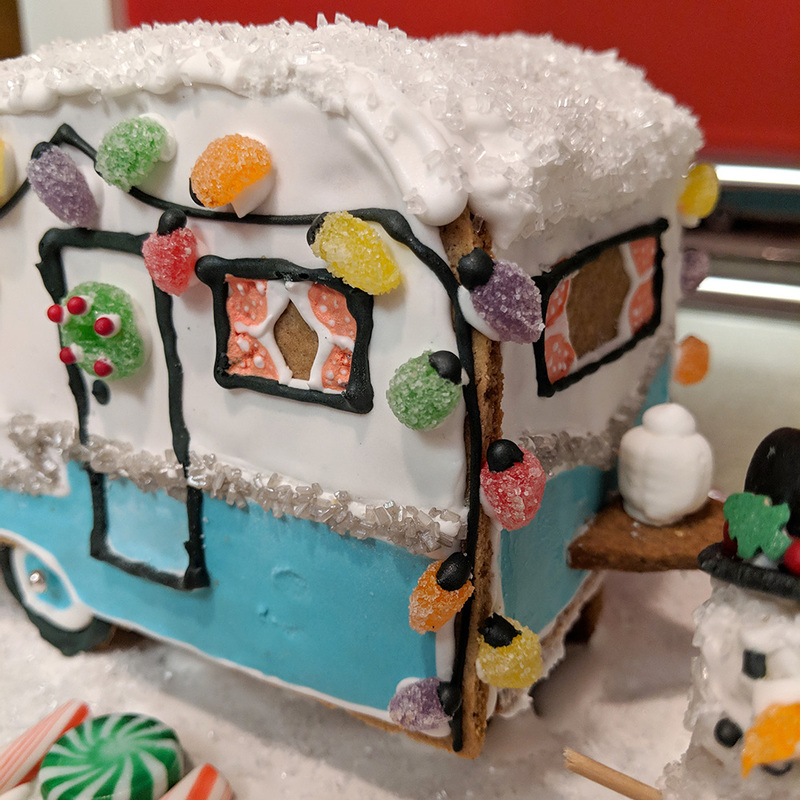 The trailer hitch was made from more gingerbread and a peppermint stick and the propane tank from a butter mint that happened to be exactly the right shape and size. 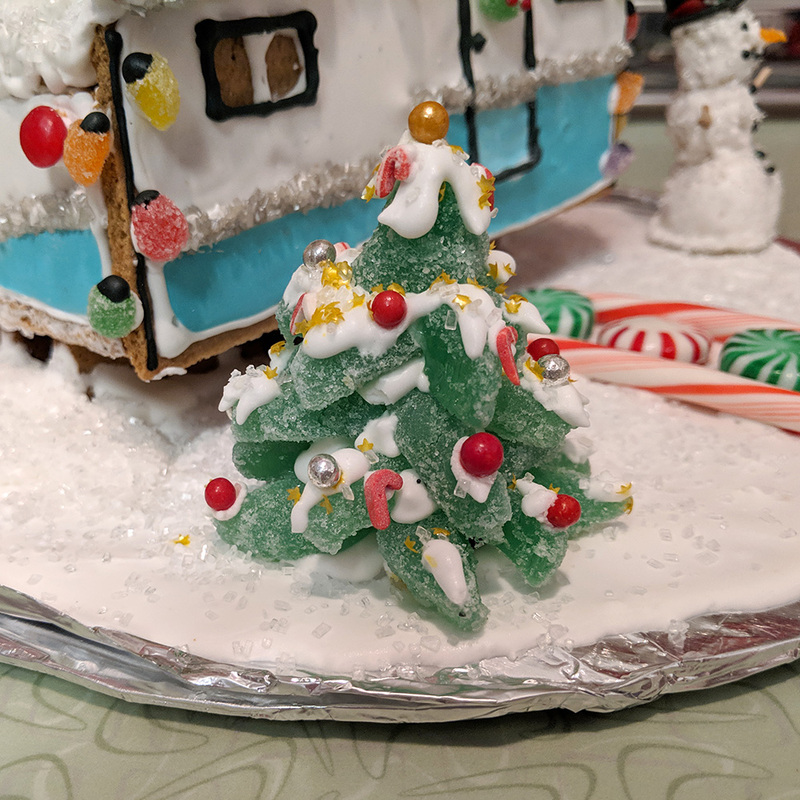 I finished my scene with a Christmas tree made from spearmint leaf candy, a marzipan snowman and a peppermint candy walkway. The only non-edible part of this was the base itself and the snowman’s arms. I’m very pleased with the way this came out but I’d love to try this basic design again with some improvements such as cutting out the windows, rather than piping them and making the roof, back and front all one piece, rather than three separate pieces.